Yes, my lovelies (said in my best Witchie Voice) it's the end of October already and that means it's time for a Reveal & Blog Hop. I'm sure you're all getting ready for Halloween 🎃👻or Samhain 🌖 but I hope you can spare a few minutes to Hop Along. I'm sure you can find some time in the next few days? October's Art Elements Design Challenge Theme was Petroglyphs, chosen by Karen Totten. As usual, I did my research and decided on a 😼. Surprised, aren't you? A cougar, to be more precise, according to this and numerous other articles. 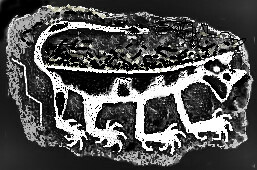 Here's what the page link below says about this particular Petroglyph. Of course, I have to put my own stamp of ingeniousness 😉 on any project (isn't that what art is all about? ), and decided that this would be a Calico Cat just like my Cannelle. I cuddled her all of September and then had to leave again :(( ... I miss her so. 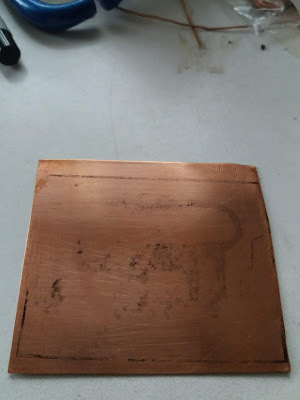 What better method than Etching for a petroglyph, and that experience brought about this blog post a few days ago about my troubles transfering images to metal, or more precisely, NOT transfering. So, evidently, my transfer didn't work as planned and I had to freehand some. I used Deco Color Paint Pens as a resist and they have not failed me yet. Look at THIS successful transfer! It only took 8 tries at painting, then screaming & frustration, then paint-removal over 2 days ... to get the claws I desired! The Remover Pen and I are buddies with a united mission. Mounted on styrofoam and ready to bathe in the etchant for 1 hour. This is a 20gauge piece of copper. I used my new friend "Remover" and a brass brush to clean and here's the result. Not exactly what I expected, maybe a reverse image with the black recessed and white smooth? But I did not have the patience to draw another! 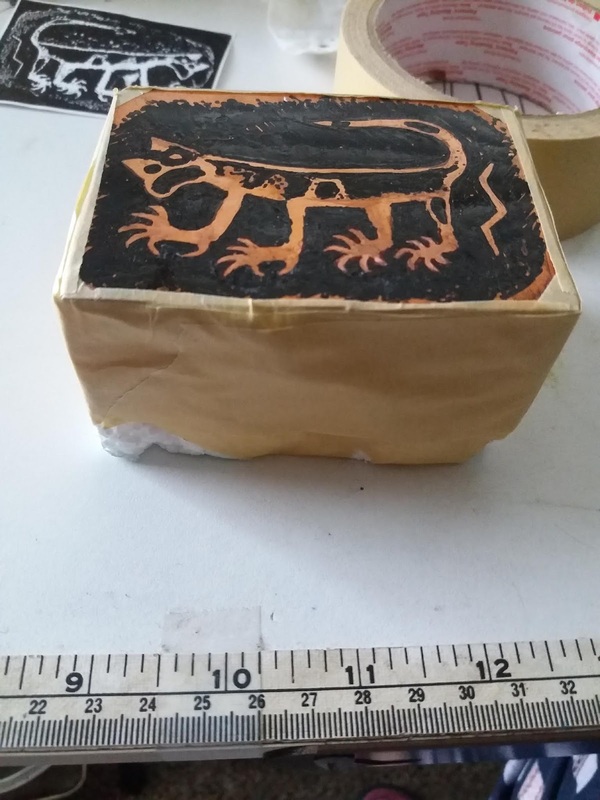 This little slice of ancient history measures about 3" x 3.5" and I have absolutely NO idea what to make with. Any ideas? 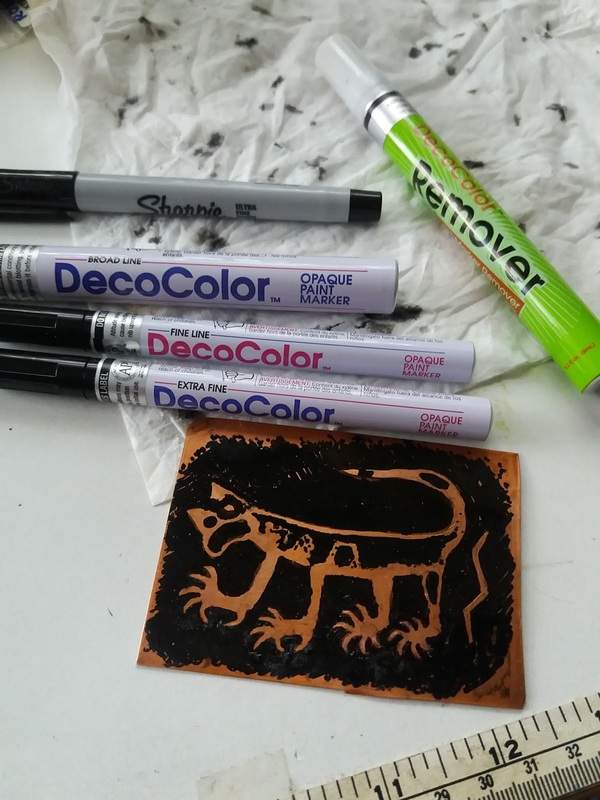 If you'd like to Blog Hop along with the other artists who partook in this Petroglyph Theme Challenge, please find the list below of Art Elements Blog Members and Guests. As always, comments and even sharing this blog post are much appreciated. Alysen, wow, what a lot of work! Glad you stayed with it! I agree with above, mount it on something, mixed media or frame it! Merci Sue, if I believed in saints, I could become one because of my patience! I know I will cut it out following an oval-ish shape. Thanks for your input, every little bit helps. Love it! I am glad you stuck with it, and the calico was definitely a help in seeing the etching. I will be sure to come back and read your earlier post. The first thing I thought of for it’s finished product was a wind chime... with little cat claws of sorts for the chimes, maybe? OMGosh Alison ... is it our name or what? I was just thinking as I was typing the reply to Sue above that I could mount it and make a wind chime!!! Really!!! And I love the claws idea for chimes!! Or eyes! Thank you for the idea. No idea, but it really is WAY cool. Of course cats are always cool! You should know! :))) ...Thank you for the compliment, Cat. Thank you for your kind words Anaflassa. I haven't yet started on the Blog Hop but I'm sure your work of art is equally impressive. Mounting it will be, that much is decided and probably with rivets. Ah yes Claire! Brilliant! I could do a rubbing or use some stamps or even some acrylic paint!! Wow, what an idea .... I have some Mold Maker and I'm going to try to start with a mold and see what that gives. Cats several times over, that don't need to be fed or taken to the Vet. But of course they won't purr and I couldn't pet their soft fur either. Being a cat lady, I really enjoyed seeing the cat petroglyph that inspired your creation. The work you did paid off with a gorgeous piece that I would frame and hand on my wall. That's really cool, I was going to say the same as Laney... a journal cover would be brilliant! Thank you Caroline. If it's a journal cover, it would have to be a gift ... don't think I'll ever really do a journal (tho I dream of it). Oh yay! I'm so glad someone else thought of etching too. 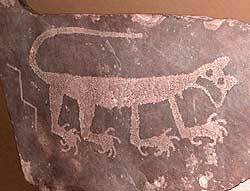 Somehow I missed the cat image in my search for petroglyph examples. I think yours came out so cool. As for what to do with it....maybe mount and frame it? Or use it as an ornament? That definitely sounds too large to work as a necklace pendant, but I suppose you could try. In any case, great job with this challenge. Great minds think alike! Ah ... ornament, now that's a novel one! It is a little large to be a pendant, but there are Statement Necklaces .... I was also thinking of a Hair Barrette or on a cuff ... so many fab ideas all of you fellow artists are throwing my way, and I thank you. P.S. Sometimes for 'inspiration' for these AE Challenges, I search in French (as for the Seed Pod challenge). 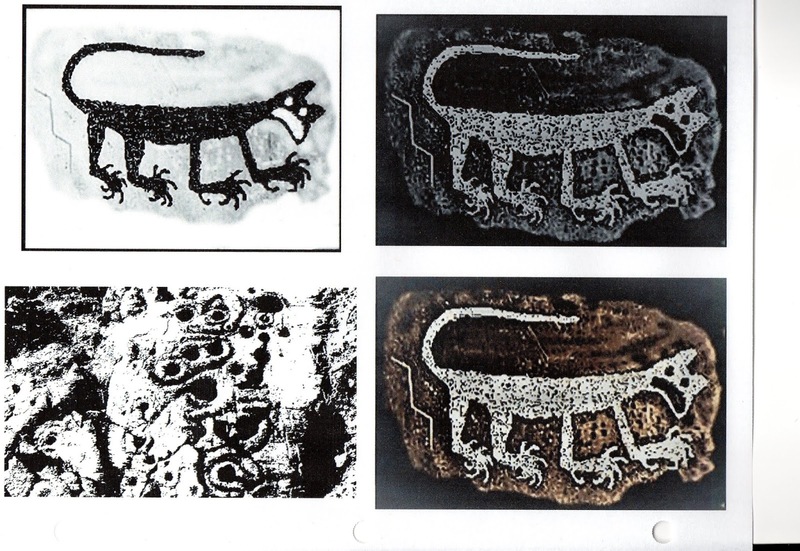 I did search 'Cat Petroglyph' in both languages and it showed up in both. Your results are wonderful! If you wanted to... you could liver of sulphur this and then clean/polish the surface. Then you would have dark in the etched areas. It could be a great book cover for a hand bound book. Or the focal in a mixed media wall hanging. SO glad you could join us! Very cool. Thank You Jenny for your nice compliment and LOS idea! I almost did that and decided to wait a little and see what ideas pop up. Over the next few days it will tarnish a little too. Mixed media wall hanging? hmmmm ... love Mixed Media though haven't done any such thing since ohhhh.... 1979.)) Definitely book cover and wall hanging are going onto one of my Inspiration Lists!!!! Great idea and I love the results. I'm sure you'll find something to use it for. My immediate thought was as a top plate for a box. Or a cover for a sketch book? Anyway, thank you for joining our challenge! Thank YOU Karen for giving us such a wonderful theme to aspire to!! Yes, your ideas are among the top suggestions. First one for a box though! Thank you all for your kind comments and great, useful suggestions! I just barely finished replying here and started 'Hopping' and it's already 9:20 pm ET. I apologize for not getting around to all of your blogs today and will do it tomorrow first thing ... promise. For now, I must get Mom ready for the night and then myself. Great minds think alike - and do you know I also though about etching for this theme. Your interpretation of the petrified puss worked so well but is so different from mine - I love that. Exactly Lesley, that's what's good about the AE theme challenges ... any medium, we could have all done the same image and each would be different and fantastic in it's own way!! I'll always go for a Puss if the theme allows! Have a great eve. I admire your determination. 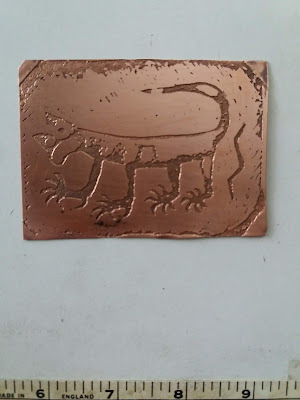 I etch copper but with stamps to put on the resist. It is limiting. I LOVE your design. It is awesome! That piece would make a fabulous bracelet or a book cover for a journal! I know the frustration of getting an image onto metal for etching. I stopped dabbling in etching because of that. I love your results. I think the piece would look wonderful in a shadowbox frame. Or maybe mounted on top of a keepsake or jewelry box? Sorry to be hopping so late! I'm impressed that you were able to freehand that image. I'm sure you'll figure out something cool to do with it! !